In my previous post I made this Salted roasted coconut flakes to use as part ingredients for this steamed sticky rice, My mom use to make this steamed sticky rice coated with fresh fine grated coconut or with Roasted coconut , In Indonesia mostly in west java this steamed sticky rice can be fry or grill on the charcoal to serve along with coconut or sauce/ sambal. 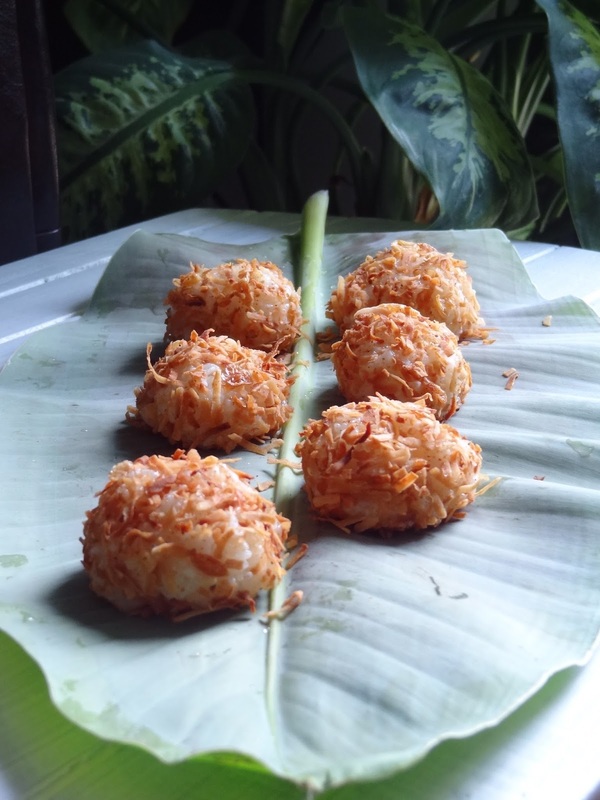 Drain rice and put in a steamer basket, lined with cheesecloth.add pandan leaves and bay leaves into rice, Steam rice, covered with lid, over boiling water until shiny and tender, about 20-25 minutes. Remove from heat and let stand, covered, 5 minutes. Serve hot, warm, or at room temperature. These are my fav and we have the same over here. But its been a long time since I have tasted. I have a whole bag of rice and just as when I was thinking of how to finish it off, I see your recipe right on the dot. The steaming is alright but need to master making the flakes from your recipe. Its awesomely tempting. 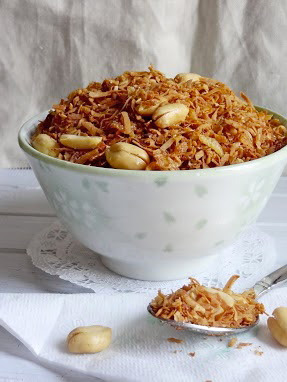 Ridwan, I love sticky rice, and with the salted coconuts...so droolworthy, and yummy!